Meanwhile, the cold wave conditions intensified in Himachal Pradesh with some parts of the region receiving snowfall from 5.30 PM on Saturday to 8.30 AM on Sunday, said the meteorological department. New Delhi: Heavy snowfall lashed parts of the Jammu and Kashmir providing respite to people from the intense cold wave on Sunday. However, the snowfall has thrown the normal life out of gear in the Valley. A minimum temperature of minus 1.3 degrees Celsius was recorded in Srinagar, which was 1.9 notches above when compared to the temperature recorded the previous night. The snowfall in Srinagar was measured at 25.2 cm. The intense cold weather conditions such as the dense fog have disrupted the movement of trains and flight operations. Electric supply in the urban and rural areas of Jammu and Kashmir was disrupted due to the snowfall. Many vehicles were stranded in the snowfall. Manali in Kullu district received 9 cm snowfall, whereas tribal districts Lahaul-Spiti’s administrative centre Keylong and Kinnaur’s Kalpa received 13 cm snowfall each during the period, MeT Centre Director Manmohan Singh said. 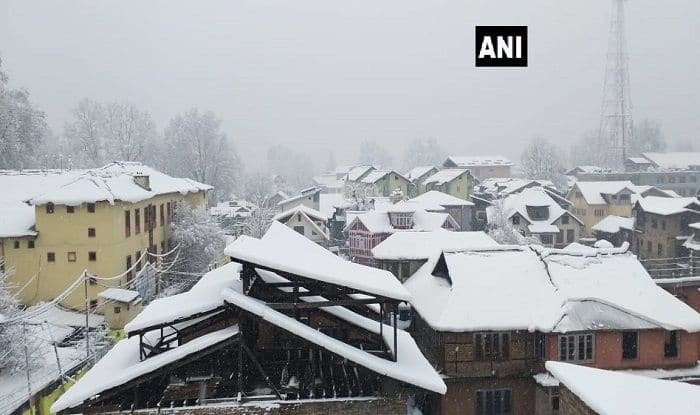 Fresh visuals of snowfall in Mandhol village of Shimla district was tweeted by news agency ANI on Sunday. Meanwhile, the cold wave conditions intensified in Himachal Pradesh with some parts of the region receiving snowfall from 5.30 PM on Saturday to 8.30 AM on Sunday, said the meteorological department. The IMD had issued a warning of heavy snowfall, rain and hailstorm in Himachal Pradesh till January 6.